Collaboration between the International Livestock Research Institute (ILRI) and German partners dates back to the early days of ILRI's predecessors: the International Laboratory for Research on Animal Diseases (ILRAD) and the International Livestock Centre for Africa (ILCA). Since the 1980s, this joint research has focused on the control of trypanosomiasis in livestock (including camels) across the vast 'tsetse belt' of Africa, as well as research on increasing animal productivity through breeding and improved nutrition of livestock. 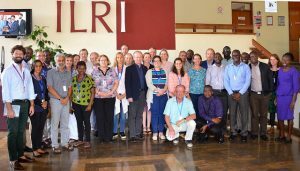 From 27 February to 1 March 2018, a three-day workshop supported by the CGIAR Research Program on Agriculture for Nutrition and Health (A4NH) was held at ILRI in Nairobi with 34 participants, including 10 visiting scientists from three leading German institutions: the Freie University of Berlin, the German Federal Institute for Risk Assessment and the Friedrich-Loeffler-Institute. The main aim of the meeting was to strengthen collaborative research between German research partners and ILRI on animal and human health. The meeting was a mix of plenary discussions and break-out sessions in technical working groups to allow in-depth discussions in specific subject areas. These thematic working groups were: 1) Ticks and tickborne diseases, 2) Foodborne and neglected tropical parasitic zoonoses, 3) Antimicrobial resistance, 4) African swine fever, and 5) Mycoplasma. A sixth working group on mycotoxins met at the World Mycotoxin Forum in Amsterdam later that month. At the end of the Nairobi meeting, all working groups delivered at least one concept for joint research and joint work mobilizing resources for the research. This post was written by Kristina Roesel, postdoctoral fellow in the Animal and Human Health program at the International Livestock Research Institute.